The hard part about playing Hasbro’s MONOPOLY is trying to find other people who are willing to play with you. All your friends who normally love to play games all complain that it takes too long to play, or nobody really wants to be banker, or your rules are different from the way want to play. Web Watch says that you can leave those friends behind. 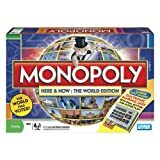 Because now Hasbro and Google have teamed up to produce a terrific interactive use of Google Maps called MONOPOLY CITY STREETS that takes the game of Monopoly and applies it to any city in the world, and you can play along at home. Sometime tomorrow, on September 9th (most likely to begin in the U.K., as that’s where the folks who developed the game are based), every user who registers to play the game will be given $3 million in Monopoly money, to spend anyway that you see fit. Want to buy Pennsylvania Avenue in Washington D.C.? You can… but it will cost you $2 million to do so. The catch is that while every street in the world may be available, they’re available on a first-come, first-served basis. So if you want to buy the street you grew up on, you better be the first one from that neighborhood to have the idea to do so. So what happens after you own a street? For starters, you automatically begin collecting rent. And you can build fabulous buildings there as well, to entice more renters to come along. And then the game fun comes along. You can make an offer to buy any street that is already owned — if the owner doesn’t reply within seven days, they not only lose the property to you, but you get that property at your offer price. Needless to say, if you’ve committed to playing the game that you’ll want to log in every day to check your offers. UPDATE: the official start time is going to be around 1pm ET, for those of you planning on taking a long or early lunch break. More gameplay information has been released as well, if you want to get an early start on your opposition. This WEB WATCH entry was posted in Games, Internet, Websites and tagged board games, game, Internet, website on September 8, 2009 by web gangsta.